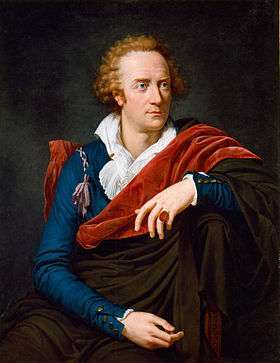 Vittorio Alfieri painted by David's pupil François-Xavier Fabre, in Florence 1793. His father died when he was very young, and he was brought up by his mother, who married a second time, until, at the age of ten, he was placed in the academy of Turin. After a year at the academy, he went on a short visit to a relative at Coni (mod. Cuneo). During his stay there he composed a sonnet chiefly borrowed from lines in Ariosto and Metastasio, the only poets he had at that time read. At thirteen, Alfieri began the study of civil and canonical law, but this only made him more interested in literature, particularly French romances. The death of his uncle, who had taken charge of his education and conduct, left him free, at the age of fourteen, to enjoy his paternal inheritance, augmented by the addition of his uncle's fortune. He began to attend a riding-school, where he acquired an enthusiasm for horses and equestrian exercise that continued for the rest of his life. Having obtained permission from the king to travel abroad, he departed in 1766, under the care of an English preceptor. Seeking novelty in foreign cultures, and being anxious to become acquainted with the French theatre, he proceeded to Paris, but he appears to have been completely dissatisfied with everything he witnessed in France and did not like the French people. In the Netherlands he fell in love with a married woman, but she went with her husband to Switzerland. Alfieri, depressed by the incident, returned home and again began studying literature. Plutarch's Lives inspired him with a passion for freedom and independence. He recommenced his travels; and his only gratification, in the absence of freedom among the continental states, came from contemplating the wild and sterile regions of the north of Sweden, where gloomy forests, lakes and precipices encouraged his sublime and melancholy ideas. In search of an ideal world, Alfieri passed quickly through various countries. During a journey to London he engaged in an intrigue with Lady Penelope Ligonier, a married woman of high rank. The affair became a widely publicised scandal and ended in a divorce that ruined Lady Ligonier and forced Alfieri to leave the country. He then visited Spain and Portugal, where he became acquainted with the Abbe Caluso, who remained through life the most attached and estimable friend he ever possessed. In 1772, Alfieri returned to Turin. This time he fell for the Marchesa Turinetti di Prie, but it was another doomed affair. When she fell ill, he spent his time dancing attendance on her, and one day wrote a dialogue or scene of a drama, which he left at her house. When the couple quarreled, the piece was returned to him, and being retouched and extended to five acts, it was performed at Turin in 1775, under the title of Cleopatra. On these tragedies, it is difficult to pronounce a judgment, as the taste and system of the author underwent considerable change and modification in the intervals between the three periods of their publication. An excessive harshness of style, an asperity of sentiment and total want of poetical ornament are the characteristics of his first four tragedies, Filippo, Polinice, Antigone, and Virginia. These faults were in some measure corrected in the six tragedies he wrote some years after, and in those he published along with Saul, the drama that enjoyed the greatest success of all his productions. This popularity is partly attributable to Alfieri's severe and unadorned style, which fit the patriarchal simplicity of the age. Though there is a considerable difference in his dramas, there are certain qualities common to them all. None of the plots are of his own invention, but are founded either on mythological fable or history. Most of them had been previously treated by the Greek dramatists or by Seneca. Rosmunda, the only one that could be of his own contrivance, and which is certainly the least happy effusion of his genius, is partly founded on the eighteenth novel of the third part of Bandello and partly on Prevost's Memoires d'un homme de qualite. Another characteristic common to every Alfieri's tragedy is that the main character is always a tragic "hero of freedom", whose ambition and need of revolution push him to fight tyranny and oppression wherever they exist. Usually, this is accomplished in the most radical manner, up to killing the tyrant and face the death himself afterwards. This desire of freedom always bring the hero in a dimension of solitude, pessimism and internal torment, but he keeps going despite knowing that the majority of the people around him can't understand or share his views and struggles, or that his goals are almost impossible to reach. This concept is called titanism. Besides his tragedies, Alfieri published during his life many sonnets, five odes on American independence and the poem of Etruria, founded on the assassination of Alexander, duke of Florence. Of his prose works the most distinguished for animation and eloquence is the Panegyric on Trajan, composed in a transport of indignation at the supposed feebleness of Pliny's eulogium. The two books entitled La Tirannide and the Essays on Literature and Government are remarkable for elegance and vigour of style, but are too evidently imitations of the manner of Machiavelli. His Antigallican, which was written at the same time with his Defence of Louis XVI, comprehends an historical and satirical view of the French Revolution. The posthumous works of Alfieri consist of satires, six political comedies and the Memoirs of his Life, work that will always be read with interest, in spite of the cold and languid gravity he applies to the most interesting adventures and strongest passions of his agitated life. He and the Countess of Albany are buried at the church of Santa Croce at Florence. He is buried between the tombs of Machiavelli and Michelangelo. ↑ Beach, Chandler B., ed. (1914). "Alfieri". The New Student's Reference Work. Chicago: F. E. Compton and Co. This article incorporates text from a publication now in the public domain: Herbermann, Charles, ed. (1907). "Count Vittorio Alfieri". Catholic Encyclopedia. 1. New York: Robert Appleton. This article incorporates text from a publication now in the public domain: Chisholm, Hugh, ed. (1911). "Alfieri, Vittorio". Encyclopædia Britannica. 1 (11th ed.). Cambridge University Press.